Forget glamping. 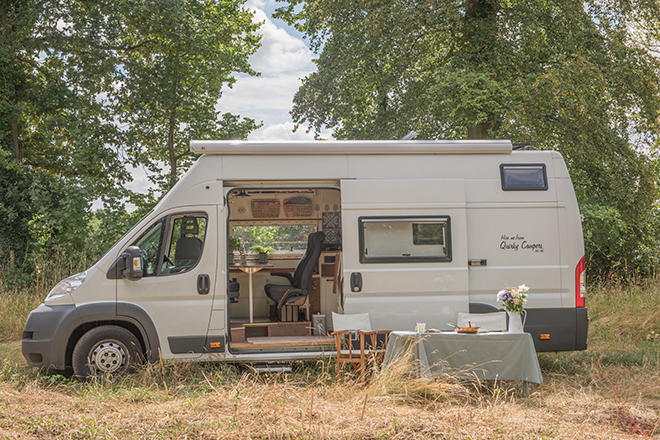 It’s all about luxury camper vans this year, and these stunning vehicles are the perfect way to spend a week on the road with a proper roof over your head. It’ll hardly feel like you’re camping at all in the Glamper RV. 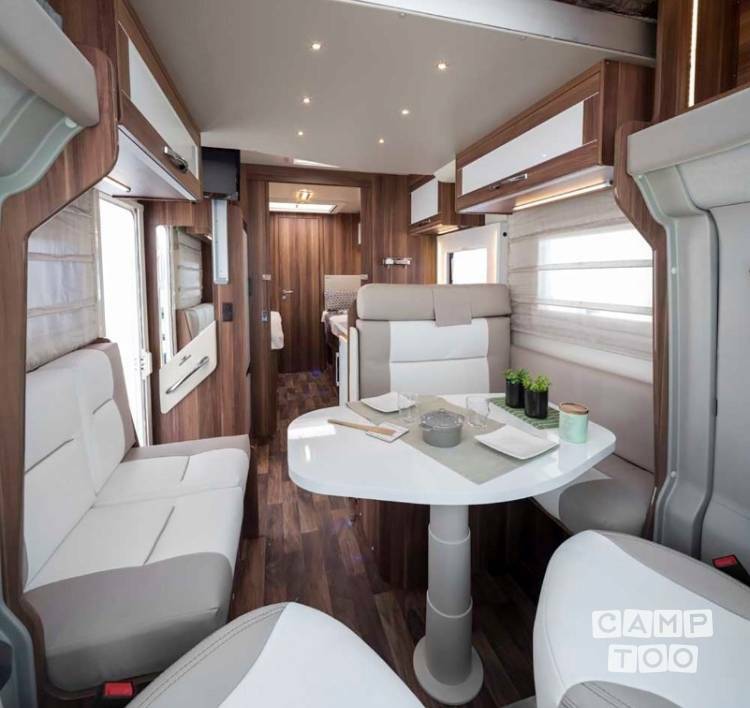 This vehicle is essentially a hotel room on wheels, utilising ingenious design to fit in two double beds, a toilet and shower, dining table with four seats and a kitchenette. 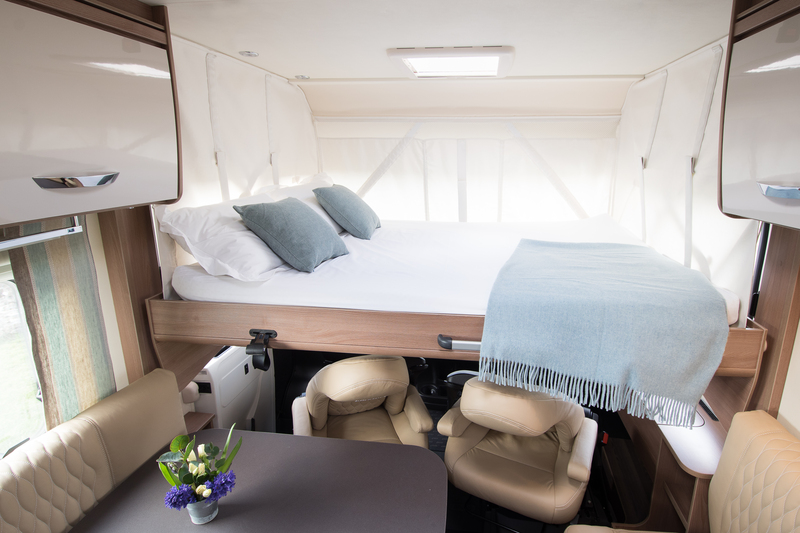 Plus, it has a few added extras that make this the ultimate luxury camper van – including an in-built hairdryer, mobile wifi and a Nespresso machine. An awning pulls out of the driver’s side to create an outdoor shelter for when you’ve parked up, and there’s plenty of space in the back for bikes, furniture and luggage. 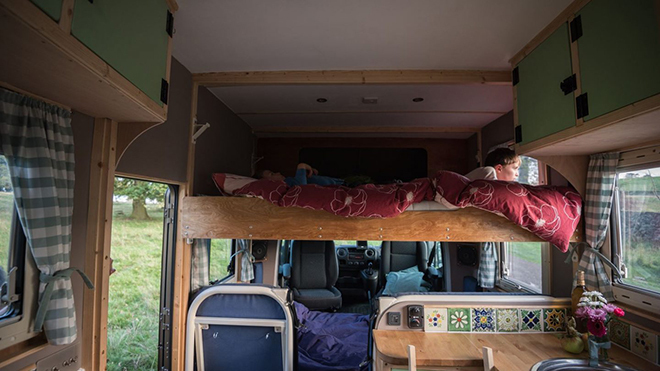 Sleeping five people, this luxury camper van is the ultimate family home on four wheels. Not far from Heathrow Airport, it’s well placed for Londoners looking to escape the city. 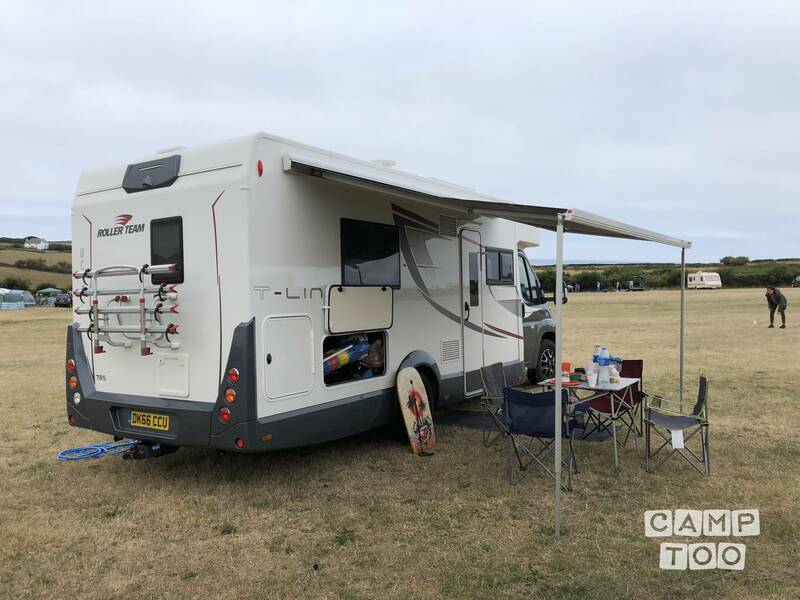 Fully equipped with an oven and hob, you can cook up a camper’s feast in its modern kitchen, and come evening, camp out under the side awning and watch the stars twinkle. Go to: Set off for the South Downs National Park and spend your days cycling or hiking its trails, before bedding down in a campsite surrounded by some of England’s prettiest countryside. Breaks from £118 per night. 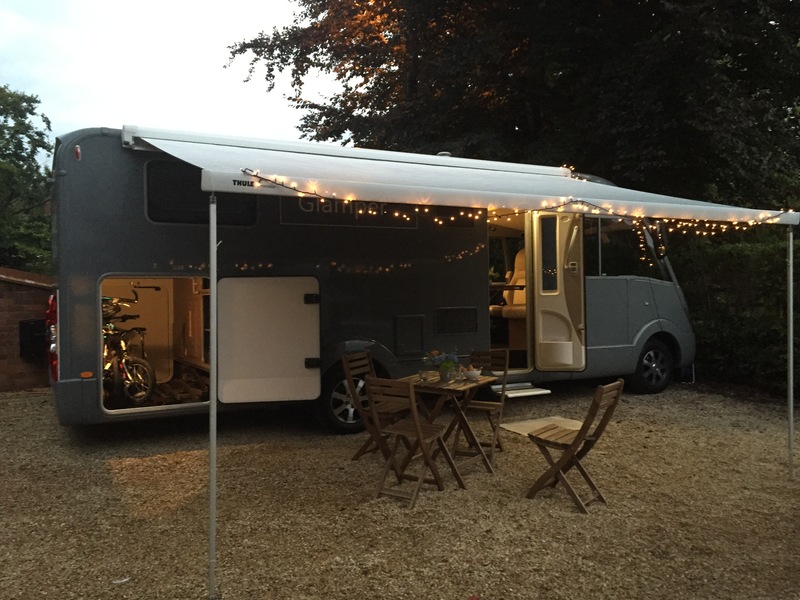 If big, hulking camper vans aren’t your style, try this delightful little converted camper from Camptoo – the Airbnb for campervans. This little van packs a lot of character, with a wood-panelled interior giving it that country house kitchen vibe and duck-egg blue painted walls. The seating area converts to a super kingsize bed come bedtime, and there are camping chairs and a folding for al fresco dining. 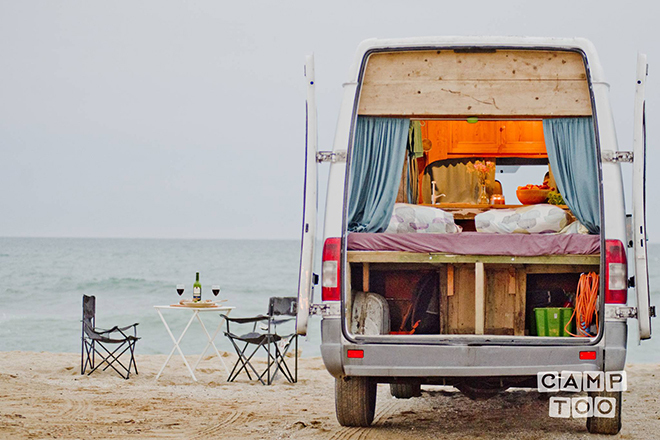 Go to: Explore the Sussex coastline in this pretty little van. There’s nothing better than waking up to a sea view, and pick your pitch right and you could go to sleep to the sounds of the ocean crashing on the shore. Breaks from £118 per night. 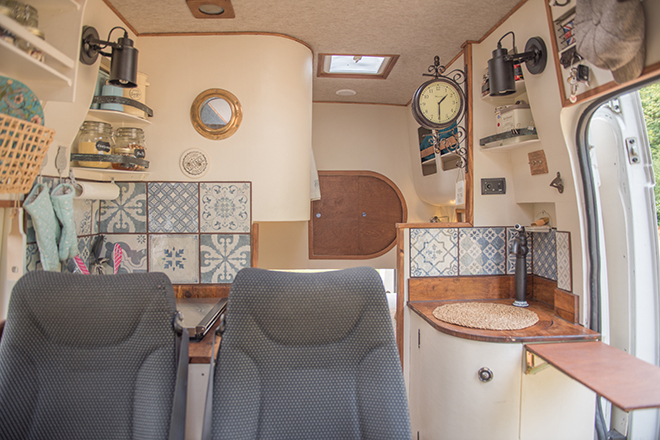 Mod-cons central, this incredible luxury motorhome might just make you reconsider your bricks-and-mortar house. There’s a bathroom with toilet and shower, ample seating space and a stylish bedroom with reading lights and plenty of storage. There’s even a TV for those rainy days when going outside feels like too much effort. 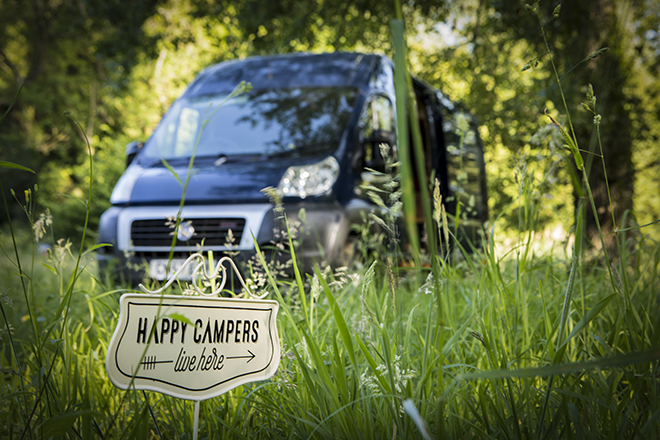 Go to: Traverse the Peak District in style with this luxury camper van. 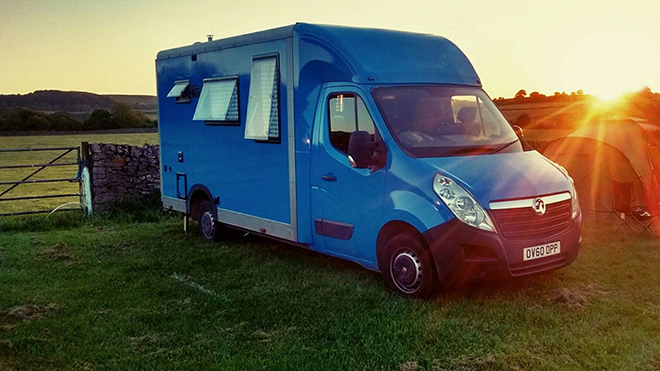 A converted British Gas van, this luxury camper is a surprisingly roomy home on wheels. 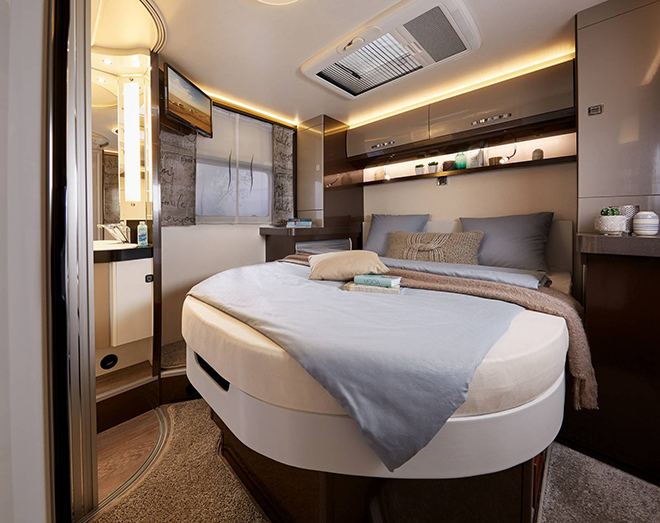 It can sleep up to six adults, so there’s room for the whole family thanks to its clever interior design. Homely touches include canvas art in the bathroom and hand-painted tiling in the kitchenette. There’s a gas hob for cooking up a warming meal at the end of the day, and a table large enough to fit five. 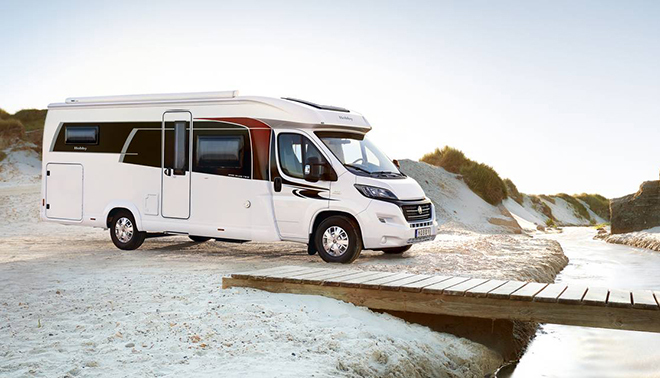 Plenty of storage space means you can bring games, and a bike rack on the back offers even more adventure options. Go to: Drive north towards the Lincolnshire Wolds AONB, then hit the coast and camp out near the traditional seaside town of Skegness. 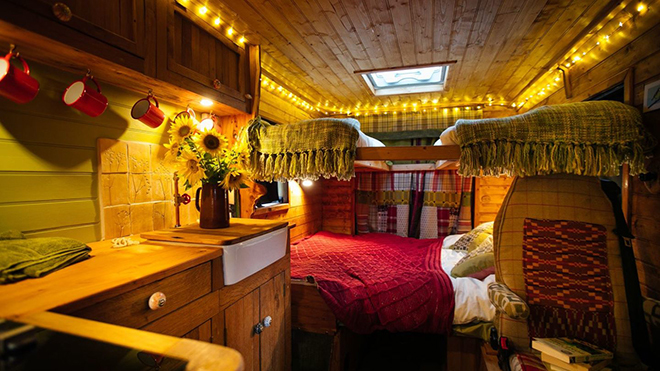 This converted Fiat van really is a gorgeous hideaway. You wouldn’t know, from its standard exterior, that inside was a cosy, quaint, country-style home inside. The kitchenette has a gas hob and wood-panelled cupboards, and a pair of built-in bookshelves by the bed ensure you’ll never be without a good read. Plus, for cooler nights there’s a small log-burning fire. An adventure in this van is truly blissful. Go to: Drive eastward and head for the Norfolk Coast – an Area of Outstanding Natural Beauty, there are stunning beaches and wonderful seaside towns to explore. Striking on the outside, Saffiyah is just a pretty inside. Beautifully converted to an industrial chic style, the van has a generous three-ring hob and spacious fridge for feeding the whole family. Dark wood and copper make for a stylish interior, with fairy lights adding a cosy touch. 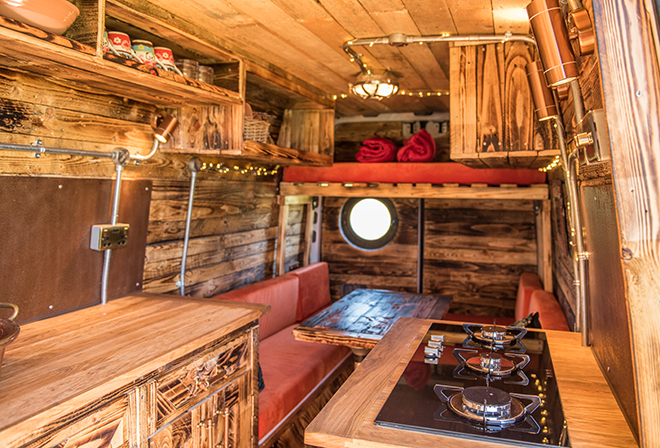 There’s an in-built wine rack, seating area for up to six people and pretty, hand-painted tableware. This might just be the coolest camper we’ve ever seen. Go to: It’s just a hop to the Brecon Beacons National Park from Saffiyah’s home, so hit the road and seek out some of the best Welsh countryside. 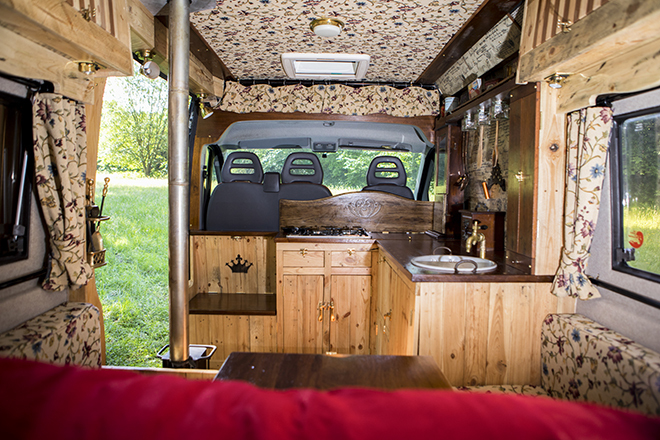 This former ambulance has been given a brilliant renovation by its owners, and Florence is a stunning luxury camper van with a difference. Enjoy a kitchen worthy of any country cottage and a generous seating area that converts into a double bed. There’s the option to add two extra bunks for the kids, too. 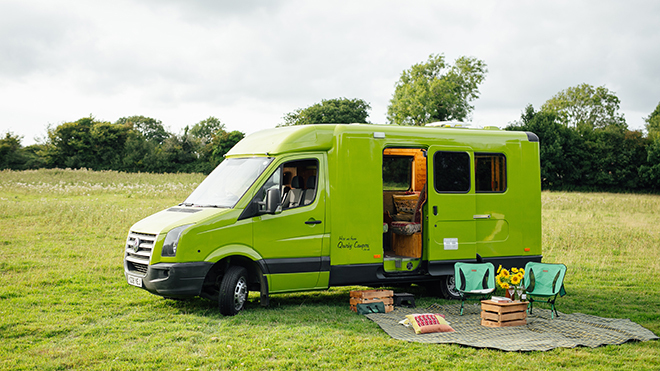 You certainly won’t be able to lose her in the campsite thanks to that bright green paint job. Go to: Make for the coast and explore the stunning Pembrokeshire Coast National Park, with its craggy cliffs and abundant wildlife. 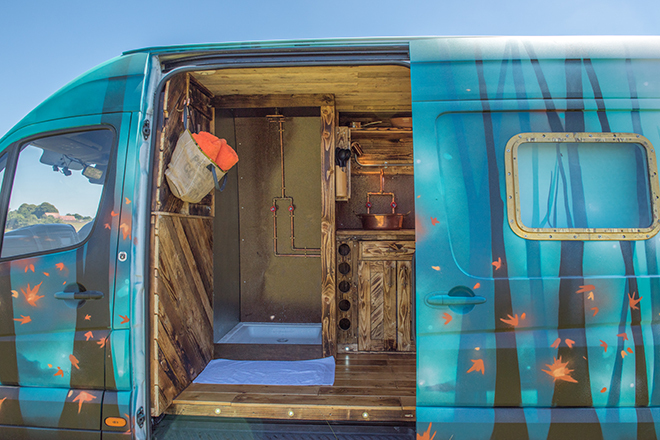 Lily is the practical camper’s dream van. She’s got countless nooks and crannies, filled with useful kit such as oven gloves and kitchen towel. 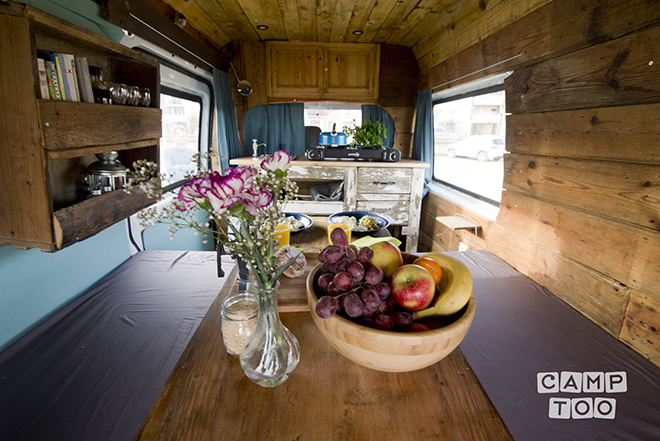 But she’s not just functional, her interior is stylish too, making her a fashionable little home on wheels. There’s room for two adults here, and there are two fully-enclosed bunks for the kids if you want to take the family away. A long window in the seating area makes for a delightfully bright dining space, and hand-painted tiles and sink in the kitchenette are a gorgeous addition. There’s a fridge for stocking up on goodies, and clever pull-out shelving for storing your cupboard essentials. Go to: The Chilterns – and Area of Outstanding Natural Beauty and a true nature-lover’s paradise.